is the Cost of Their Toys. Trust your vehicles to a storage facility you can count on: Ferguson Big Boy Toy Storage offers clean, secure storage for all your recreational vehicles, trailers, boats and automobiles. We keep your toys safe, until you’re ready to play again! Independently-owned and locally-operated, Ferguson Big Boy Toy Storage is your destination for vehicle storage units in Lubbock, TX. We offer the ideal stow-away for your vehicles while they’re off the road, out of the water or resting between adventures. We know how to care for your vehicles. Our facility includes units in sizes of 14 x 45 and 20 x 45—perfect for your motor home, travel trailer, fifth wheel, boat, classic car and more. We provide easy drive-up access to your unit and 24/7 accessibility at our facility. For added convenience, each unit includes a small and large entry door. 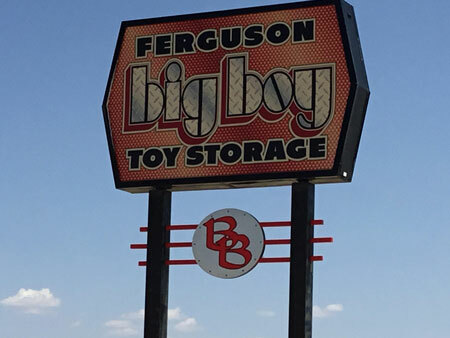 At Ferguson Big Boy Toy Storage, our top priority is keeping your property safe and secure. Our security cameras ensure a set of eyes are always on your vehicle, and our security gate with 24-hour access ensures you can always access your unit, but trespassers can’t. Our exceptionally secure facilities allow you to rest assured that your vehicle will remain untouched by prying hands and remain in the condition you left it. Protected from the elements and vandalism, your RV, boat or car will be ready the next time you want to go for a spin. Contact our friendly staff today to make arrangements for your self storage in Lubbock, TX. Our business was established in 2010 and proudly serves the vehicle storage needs of customers throughout Lubbock, TX. Our facility is monitored 24/7 to give you peace of mind about the safety of your items. We offer units with electrical hook-ups for your convenience. We provide large storage units to accommodate any size RV, trailer, boat or other vehicle. Our customers enjoy easy drive-up access 24 hours a day through our secured entry. Do you need a safe place to store your vehicle between outings? Contact Ferguson Big Boy Toy Storage to make secure arrangements for your RV, boat, car, ATV or other vehicle.